The holiday on Monday has me a day behind. I have thought all day that today was Monday and I had one more day to get my Tips, Tricks, and Tuts Tuesday - Adding Borders ready. I'm also a day or two behind because I just got back from a wonderful 7 day vacation Cruise to the Western Caribbean. I'll post pictures of that later in the week. So how to you measure for your borders to add to your quilts? Or do you measure? Please don't tell me you don't just start sewing your borders on without measuring them and then whack it off at the end. If you do, you'll likely end up with a friendly quilt. Those borders will be waving at me (or your longarm quilter) like this one is. To prevent this and have a somewhat square quilt here's what you can do. Take 3 measurements of the quilt center. The first one should be a couple of inches in from the top edge. The second one should be across the middle. And the third one should be a couple of inches in from the bottom edge. If you have a difference of an inch or so, you might want to go back to your blocks and square them up a bit. It will be difficult to work in more than an inch or two. Write each measurement down. Measurement #2 = 44 1/2"
Measurement #3 = 44 3/4"
The total of the 3 measurements is 134 1/4". Divide that by 3 and you get 44 3/4". Cut the top and bottom border 44 3/4". When you're ready to sew the border to the quilt top, place a pin in the center of the quilt top at the top edge and at the bottom edge. Now place a pin at the center of the edge of each border strip. Match the center pins and pin the border to the quilt top. 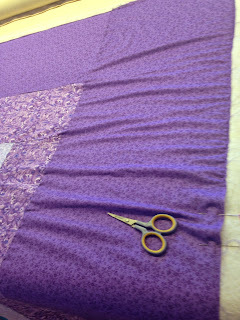 Now pin each end of the border to the quilt top and place additional pins in between. 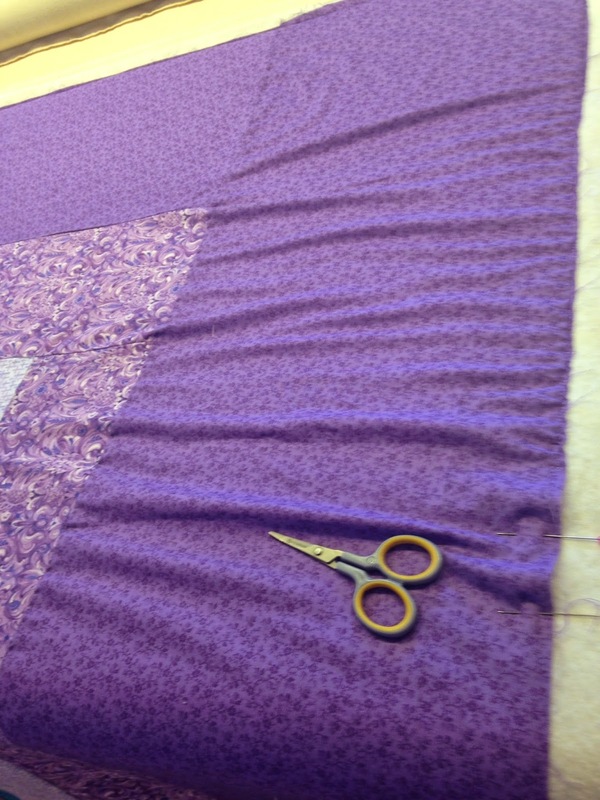 This allows you to "work in evenly" any fullness you may have in the border or the quilt top. You can further divide the border and quilt top into quarters as well as halves, particularly if you're working with a larger bed size quilt. I rarely use pins when piecing a quilt top but will ALWAYS use pins when adding borders. If your border is a bit larger or smaller than the quilt center, place the longer piece on the bottom, next to the feed dogs of your machine. They will help "ease" in the fullness of the longer piece. Repeat this process for the side borders. Some instructions will suggest that you add the side borders first and then the top and bottom. Either way is fine, as long as you are consistent throughout the entire quilt. Each time you add a border, do the 3 measurements again and repeat the process. You will be so much happier with the end result if you will take the extra time to add your borders like this. One last tip on borders. Although most patterns (including mine) will tell you to cut your border strips the border width by the width of fabric (for example 6 1/2" x WOF). This is perfectly fine, however, you will have less "stretch" or "give" if you cut your border strips the length of the fabric (parallel with the finished selvage edge). I personally like to cut my borders like this. There are lots of options and considerations for borders like size, color, pieced or plain, etc. that I am not going to address in this post but hopefully this Tips, Tricks, and Tuts Tuesday - Adding Borders will give you a fabulous finish to your beautiful quilt. Great tips, thanks! I don't usually have wavy borders, but every once in a while it happens and it doesn't look pretty at all! Good tips!! I just did my first mitered border yesterday...definitely a different way then I am used to!! As a longarm quilter, I have had to create seam lines that were really huge tucks because the quilter just laid the fabric down, sewed and cut when they got to the end...what a mess!! !